Brasília is a city composed of reinforced concrete, a paragon of the tenets of modernist architecture and city planning. Enfolded by the artificial Paranoá Lake, the city fashions a curious structural plane; a grid-like formula of post-war modernism arranged into a light curve. Brasília was constructed in the late 50’s from scratch according to the blueprints by the urban planner Lucío Costa, landscape designer Roberto Burle Marx and the architect Oscar Niemeyer. The three designers proposed a set of speculative opportunities for the future of architectural utopia; future, that some sixty years later has lost itself somewhere in the murky water between the past and present. A far cry from the buzzing city streets of Rio and São Paulo, Brasília is a plateau mostly of purpose-built bureaucratic and governmental settings. PR Info _ Brasília is a city composed of reinforced concrete, a paragon of the tenets of modernist architecture and city planning. Enfolded by the artificial Paranoá Lake, the city fashions a curious structural plane; a grid-like formula of post-war modernism arranged into a light curve. Brasília was constructed in the late 50’s from scratch according to the blueprints by the urban planner Lucío Costa, landscape designer Roberto Burle Marx and the architect Oscar Niemeyer. The three designers proposed a set of speculative opportunities for the future of architectural utopia; future, that some sixty years later has lost itself somewhere in the murky water between the past and present. A far cry from the buzzing city streets of Rio and São Paulo, Brasília is a plateau mostly of purpose-built bureaucratic and governmental settings. The austerity of modernist architecture lends itself to Vincent Fournier’s photography series that bear the name of the concrete capital. Here, architect Oscar Niemeyer’s work constitutes the backdrop for Fournier’s retrospect of the grandiose dream of posterity. Fournier’s photographs buttress Niemeyer’s consolidated vision that finds its counterpart from the urbanism of Le Corbusier; a political, as well as a technical project concerned with land use and its implications to transportation and physical activity. 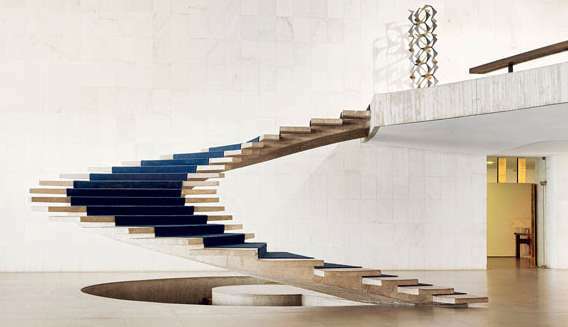 In Fournier’s images, Niemeyer’s formalistic fictions appear like relinquished film sets from Jacques Tati’s Playtime. The photographs exist as carefully composed and colored geometrical entities, just like Tati’s, as if to remind us about the memory of a lost future. Interestingly, in the contrived landscapes and interiors Fournier delivers, anything human is expressed rather via lack than excess. Throughout the series only a handful of people is positioned in the images. 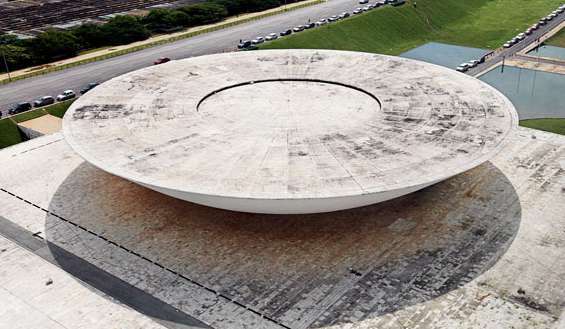 In Fournier’s exterior shot of the Chamber of Deputies, Niemeyer’s concrete lines and curves appear like an absurdist outtake on governmental functionalism turned into an artistic experiment, more specifically into what appears like a flying saucer. Fournier’s image constitutes a language that from the outset seems purely aesthetic but reveals itself to be above all ideological, like all modernist architecture was. Fournier’s simple composition is elegant and clever, approaching the utopian object from an angle that provides us an opportunity to access the construction a new. Respectively, Fournier’s work highlight the sophistication and precision of Niemeyer’s practice.